Every 7-8 years, I get some apricots off my tree. This is year 8 and my second crop since moving here 16 years ago. Not a great success rate but usually here in Santa Fe, we have a freeze in late spring that freezes the apricot blossoms and hence no crop. But this year, it’s been exciting as I’ve seen apricots everywhere in town and out-of-town. What a bumper crop this year! So I made apricot jam, dried some and the other day I got ambitious and made an apricot tart from one of Juliet Child’s books that my friend John gave me! I gotta say, it was good. Really good. 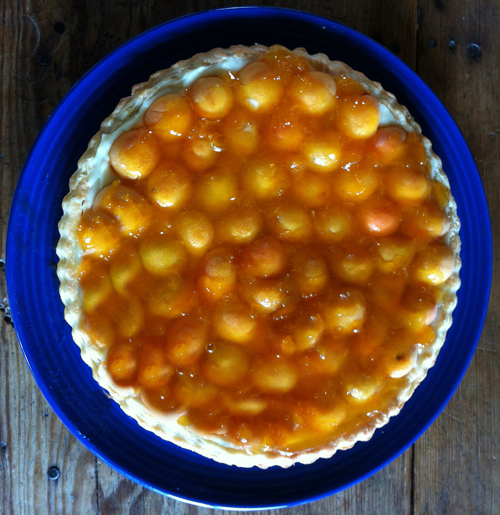 This entry was posted in apricots, general and tagged apricot tart, apricots, growing fruit, processing apricots. yummo! Will you share the recipe? I have a fabulous one from a good crop here a couple years ago–apricot chutney—and it freezes great. You bet! Let me pull it together and I’ll put it here on the blog. We are done with our apricots now. What is the packing in sugar method? I’m not familiar with it.